Station 19 was originally placed in service in 1909 at Maple and Conway, replacing House 3. In 1930, a single-bay, two-story brick building was erected at Highland Parkway (then Otto) and Snelling Ave. in Highland Park and leased from the Water Department for $1 per year. In 1958, the present Station 19 was built at 2530 Edgcumbe Rd. Ladder 8 was assigned there until it was put out of service in 1959. 1n 2017 Station 19 was remodeled adding a bay for a ladder truck and additional living space for four fire fighters. The renovated Station 19 reopened October 7th, 2017. 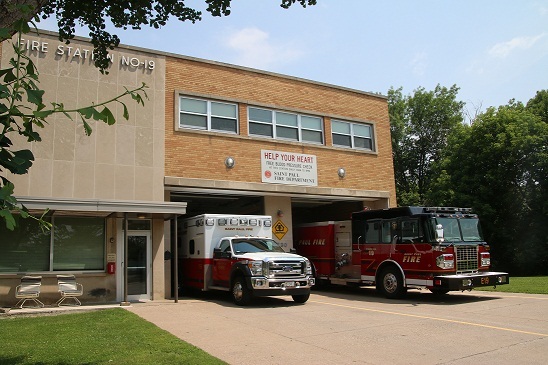 Current Station 19 Deployment: Ladder 19, Engine 19, Medic 19 and Boat 19.